A packed audience filled the house for the “Becoming an Ally for Diversity Workshop” on the first day of the Tech Inclusion Conference 2015. Why was this session drawing such a crowd? For the very important issue that touches all of us in our workplace and social fabric. The question on the minds of attendees was…how can we move towards equity? To better understand the current challenges, Danielle DeRuiter-Williams, CEO of The Justice Collective, provided the context. She points out that allyship is a lifelong process. Solutions need to be adapted to developing disparities, not just those that were once identified in the distant past, referring to the example of racism after September 11. “It’s a pipeline issue.” When looking at allyship from an organizational lens, greater social context and causes need to be examined, such as the prerequisites to the pipeline. For example, what are the individual and systemic barriers to entry in your communities and for those around you? Are the same school programs being offered where you grew up? How about those of your colleagues? Are the educational resources the same for each community? Empathy; think about the possibilities of what could have made someone else’s experience different from yours. What are the ways to becoming an ally? Elana Isaacs, national consultant, trainer, and facilitator with extensive experience custom-designing embodied leadership, equity, and team development programs for business, non-profit, and school leaders, implicitly believes in the implementation of an equity framework for organizations. “It’s a culture issue.” How many of the organizations that you’ve worked for integrated some form of an equity framework in its company mission, values and goals? Are values and actions and organizational goals aligned? How is it working for you and your team? How is company culture driving the organization forward? How does it affect recruitment, productivity and retention? Asking these questions can help with the assessment for an equity framework need or adjustments from within organizations. Educate yourself (taking initiative) by talking to someone who is different from you to gain an understanding of what “different” looks like and means. Be a mentor or find a mentor who can provide context. Pipeline at the structural level; apply an equity framework to thinking about allyship as conversations are happening on teams and organizations, bring it back to the values of the company. Form an equity assessment tool, what is the company culture, what are the measurements of success? From an the interpersonal perspective, a lot of us want to just help and problem solve and so we might start coming up with solutions immediately, however is that really what the individual is looking for? Try listening to those who need support and then ask how they may need help. “Being willing to look at my impact versus intent and being humble about that is a crucial thing about allyship.” ~ Elana Isaacs. Engage in support of equity whether you are in an underrepresented group or not. Using intersectionality to deny your part (because you yourself are part of a marginalized group) is not going to help with equity. Expect that with trust the uncomfortable conversations can be shared openly and recognition of challenges can occur, and from there solutions can happen. Discomfort is not a bad thing. These conversations are going to be uncomfortable. This is the expectation, not the exception but the rule. Thinking and practicing allyship, for consistency, over the long term is necessary for social impact. Being on the defensive isn’t being accountable, instead practice awareness, listening and providing invited solutions. The original artwork above by sums up the workshop. 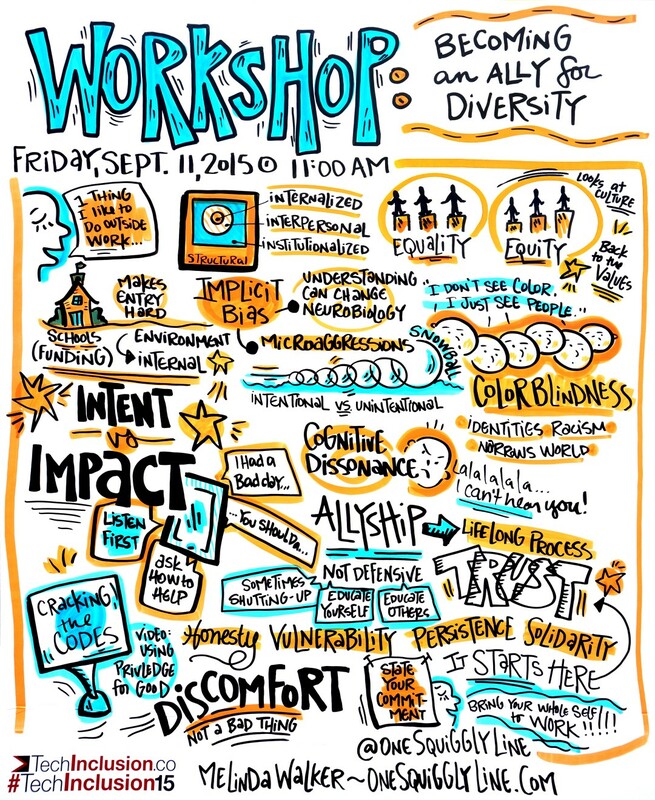 To learn more about becoming an ally for diversity please view the following video links from the Tech Inclusion Conference 2015 workshop.